Striking coastal scenery, beautiful hills and cleared villages – something that has made parts of the Highlands hugely popular with visitors. It seems, however, that this fondness doesn’t always stretch to the east coast of Caithness and Sutherland, which is too often overlooked as people blast up and down the A9. My own view is that the area is still relatively inaccessible. The A9 is the only linear route going all the way up the coast (even the railway turns inland at Helmsdale) and there is little, if any, provision for walkers and cyclists most of the way. But one man has been leading the charge to turn that around, at least for walkers. Jay Wilson came to the area to recce the last part of his planned Land’s End to John O’Groats long-distance walk as he didn’t want to do what so many people do and trundle up the side of the A9 for mile after mile. He found some tracks and trails along the coast but discovered other ways were blocked or overgrown. So he came back again and soon he had started what was to become the John O’Groats Trail. I joined Jay along with fellow volunteers and members of the Caithness Waybaggers and Inverness Ramblers, as well as other enthusiasts, on a section of the route to mark two years of progress on the trail. It’s amazing what can be achieved with determination. Parts of the route are now way marked, the route is becoming more established and there are plans to publish a guidebook and map. Jay has had enquiries from across the world from people wanting to walk the trail and I’ve seen myself that people are using it already. 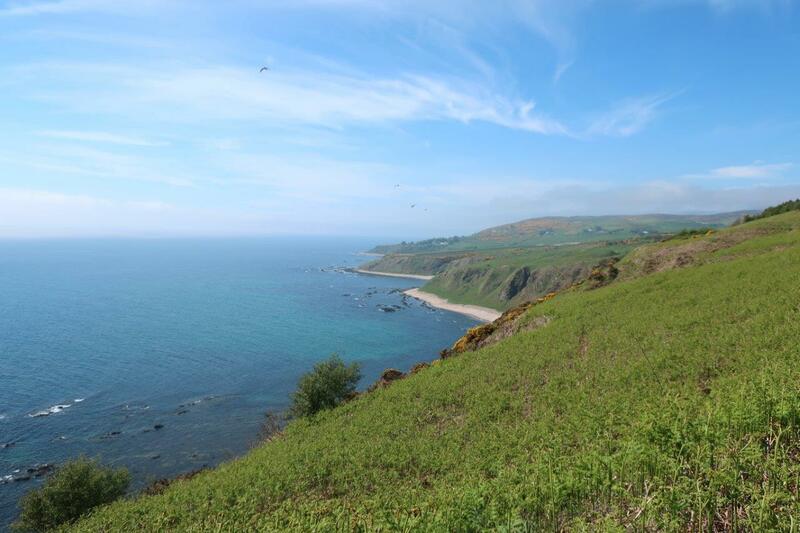 As we set out from Helmsdale harbour on a bright and sunny day with the haar still hanging over the Moray Firth, there is an easy path to follow but soon it becomes clear that navigation skills are required to negotiate this route. The secret is in connecting all these disparate paths and forming a linear trail that appeals to the long-distance walker, while also providing opportunities for shorter walks along the way. A draft guidebook is available on request (in exchange for a donation) for those wanting to walk the route before it is published, hopefully later this year. It’s a valuable guide to keep you on track through the fields and farms cradled between the road and the sea. You rarely feel close to the road, though. We pass a World War II lookout, an important part of the country’s defences, now rusting away on the top of the cliffs, before crossing a burn and scrambling through some gorse – its glorious smell floating on the breeze as its yellow flowers glow in the summer sun. Pausing for a break overlooking the Green Table, the site of an Iron Age fort called Dun Glas, we take in the view out over the firth, spotting wildlife and boats far below. Then we’re back on the trail. Before we know it – and with no indication – we have crossed the county border into Caithness and we’re following the old coach road. This used to be the only route in the area for transporting goods up and down the coast, and incredibly the road bed seems to still be fairly well maintained in parts. We fork off to the right at a sign and make our way towards the Ousdale broch, the best preserved of its kind in Caithness, which has more of these Iron Age structures than anywhere else in Scotland. The Caithness Broch Project has plans to maintain and preserve the broch at Ousdale, despite it suffering some recent collapse, as well as build a broch using traditional methods as a tourist attraction. Beyond the broch there’s a very steep drop through trees and grass to reach the Ousdale Burn, where volunteers have built a bridge over the water with materials donated by the Langwell-Berriedale Estate. Jay tells me that the vast majority of landowners along the entire route from Inverness to John O’Groats have been supportive or openly enthusiastic about its development. Working with them, it has meant stiles and simple bridges have been built by the volunteers, as well as way markers being installed over much of the route. Further on we arrive at the edge of Badbea, a clearance village which was finally abandoned in 1911. The evicted families were given work building a great stone wall to keep the sheep away from the steep slopes that drop into the sea – the very place where the families were expected to live. A monument to the families was later erected naming the people who struggled to make a life here. We now followed the wall to reach a track that leads behind Cnoc na Croiche and I couldn’t resist a brief detour to the top to take in the viewpoint over Caithness’s most popular hills, Morven and Scaraben. After a gate the trail turns right to descend through fields towards the twin towers at Berriedale, which were built to help guide fishermen into the mouth of the river and are known as the Duke’s Candlesticks. 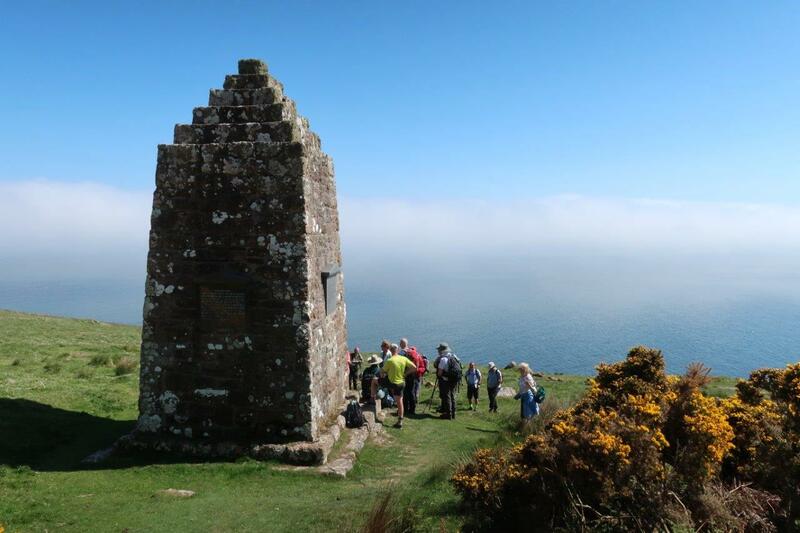 The navigation beacons are thought to have been made in the early 19th century. The descent into Berriedale offers lovely views north along the coast and down into the bay with its rows of white cottages. Our route was ending here and we regrouped at the delightful River Bothy café, which sits alongside the old road and bridge. As for Jay – he never did go back to do Land’s End to John O’Groats. 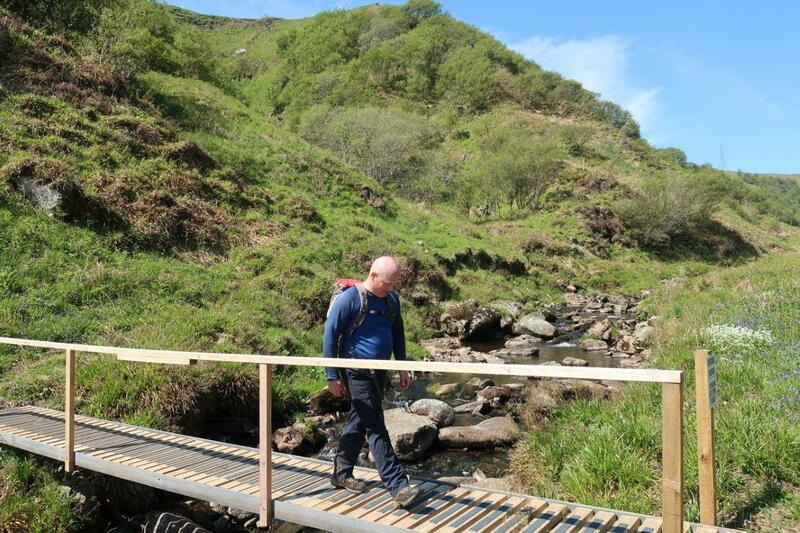 He’s made it his mission to improve this stretch of the walk for others to enjoy, and to show the far north’s treasures off to them. It’s a real community effort, led by one man who has fallen for this remarkable and beautiful landscape that people have been calling home for thousands of years. Hats off to him. The John O’Groats Trail is a 147-mile walking route from Inverness to John O’Groats, following quiet lanes, shoreline, cliff tops and footpaths. 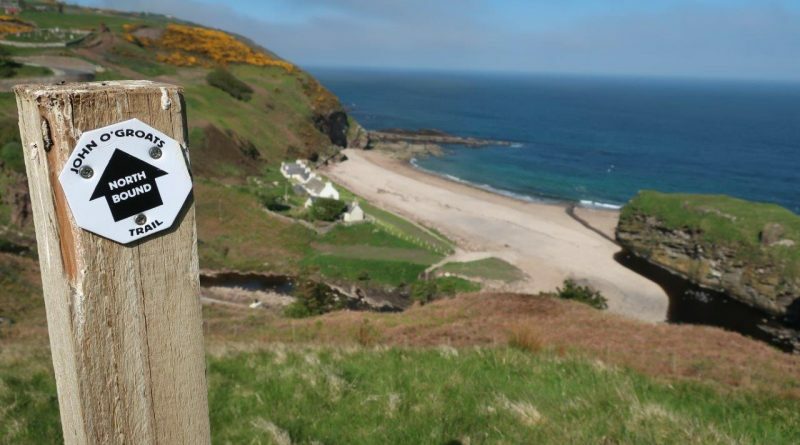 It is divided into 14 sections, making shorter trips possible as well as connecting to other long-distance trails in Scotland. There is still work to be done on the trail, so don’t expect a West Highland Way-style experience! Some sections are well established and popular walking routes in their own right, while others are more challenging. Obstacles to be found on the way include barbed wire fence crossings, stone wall climbing, river fording, boulder scrambling, strenuous walking or slashing through summer vegetation. Livestock will also be encountered in some fields. The Friends of the Trail group works to improve the route as well as promote it. This was granted charitable status in 2016 and is chaired by Jay Wilson, the founder of the John O’Groats Trail. It was announced last week that a trio of politicians have agreed to be patrons of the trail. Lord Thurso, MSP Jamie Stone and early years minister Maree Todd are supporting the trail – and Ms Todd joined us on the walk from Helmsdale. She said: “It’s an absolute pleasure to be appointed a patron of the John O’Groats Trail. The trail is a fantastic idea and I look forward to helping it develop and grow over the next few years. “It meanders through some of the most spectacular scenery in the world and there is an abundance of wildflowers, wildlife and history to see on the way. Thank you. I looked at the ramblers’ web site and found it very interesting. Should you hear anywhere of such a walk covering this part of the trail, please do post the info here. We didn’t have time to try this part of the trail again, and would like to do it next spring/early summer. Is there any chance of you or someone familiar with it, who is likely to lead a party, rather like the photos in your blog, doing it again next year? If so, we would be grateful if we could join it. Please get in touch if this is a likely scenario. Thank you for this post. It shows me that this walk CAN be done! We tried it today, and failed up on the hillsides to the north of Helmsdale. Our legs are still tingling from struggling through the rough growth, especially the whins, growing all over the hillside. We had GPS with us, and always knew where we were, but we didn’t manage to get through the late summer growth, and indeed, although beginning to be familiar with the terrain up there, we never even found the steep descent referred to by both the JOG trail website and you. We were extremely disappointed to fail – our first such failure we have encountered in well over a thousand miles of walking. If you have any suggestions as to how we could have failed, I would be delighted to have them. We are certainly grateful to the work all the volunteers have put in to the JOG Trail project.